Serenity Beauty offers an alternative to Skin Rejuvenation. The technically advanced Ellipse IPL Skin Rejuvenation using an Intense Pulsed Light system. Your personal requirements are overseen and performed, in confidence, by our senior IPL specialists. Everybody loves the sunshine! It’s good for the soul and the immediate effects it has on the skin such as a tan and healthy glow are much desired. However in the long term sun exposure decreases the production of collagen and leads to uneven pigmentation, redness and a lack of firmness. Our Ellipse IPL Skin rejuvenation treatment rejuvenates the skin by removing pigmentation, diffused redness and in addition to this, it leaves the skin feeling smoother and more even in texture. How does the Ellipse Light work for Skin Rejuvenation? Age spots and hyper pigmentation contains melanin and diffuse redness contains haemoglobin. The light is absorbed by the melanin in the pigmented area and the heat reaction caused breaks down the melanin in the keratinocytes. A photo toxic reaction occurs in the melanin vesicles and the excess melanin turns darker before it comes away from the skin. The light is also absorbed by the superficial blood vessels in the skin. The heat reaction caused coagulates blood vessels, destroys protein in the wall of the vessel and furthermore stimulates collagen production. Skin Rejuvenation is the treatment of sun damaged skins. 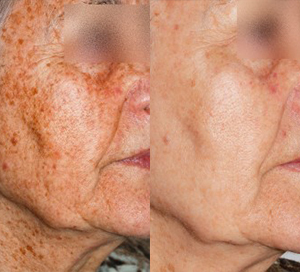 The IPL laser sun damage pigmentation removal treatment can be used for diffuse redness (high colour) and pigmented lesions such as hyper pigmentation, solar lentigines (sun spots) and freckles. The best results are seen with clients of skin types 1-3 and skin type 4 can be treated with care. It is important that the client avoids sun exposure 30-60 days prior to treatment. Sun exposure can increase the risk of pains or burns from excessive light absorption in the epidermis. If the client has a sun tan it may be better to wait until the colour reduces to achieve the best results. The Ellipse has preprogrammed treatment suggestions for different skin types. From client to client the sensation will vary, but it is the second strongest of all the treatments. The sensation that is felt depends upon the amount of melanin found in the skin. The sensation is described as a heat sensation and a few clients compare it to mild sunburn after the treatment. On average 1-3 treatments at 4 week intervals are needed for the best results. Top up treatments may be needed in the future to maintain these results. For the optimum collagen stimulation effect with Skin Rejuvenation 6 treatments at 4 week intervals would be recommended. It is important to avoid tanning (sun, sunbed, fake tan) before and during the treatment period. If not, your skin will absorb more light, which makes the treatment less effective. Generally no post-treatment care is necessary, but patients with sensitive skin may benefit from applying soothing aloe vera gel. Furthermore, it is recommended to use a SPF 30+ daily. What can I expect as far as results? The pigmentation will become darker in colour immediately after the treatment. A few days after the treatment the pigmented areas will develop a light crust (this is a good sign that the treatment has worked). After that the skin will look smoother and fresher. A few more treatment sessions may be required to keep a smooth and youthful appearance. Clinical trials documenting Ellipse’s safety and effectiveness are carried out by leading doctors prior to the release of the product. The results of these tests are then published in respected, refereed medical journals. Why have Treatments at Serenity Beauty? Our Specialist IPL/ Laser therapists are dedicated to providing personalized esthetic treatments to address a wide range of skin care issues for the face as well as the body. Our knowledge expands from training, demonstrations of the equipment to medically assisted treatments on the Ellipse Machines. Our therapists have refined their ability to deliver safe and ethical treatments, which reflects in our standards of Clinical Excellence. 2 .Free no obligation consultations and patch tests are available.